Cleaner Solutions, a local independent company, offers a Whole House Program to provide all the cleaning solutions a restaurant needs at one efficient price, including front of house, back of house, ware wash and cleaners and sanitizers. With the Whole House Program, we offer a flat monthly rate to guarantee that you will stay on budget. We manage your chemical program by working directly with staff and monitoring your usage to cut down on waste or misuse of chemical cleaning products. This ultimately takes stress off the operator and cuts down on the hassles associated with cleaning solutions including keeping the chemicals up to par, putting the stock away, managing employee chemical uses and more. What are the steps we take to start the Whole House Program? Survey: We do a survey of your current products, usage and concentrations to learn what the restaurant buys and how much the restaurant uses. Assess: We perform an assessment and quantify your spending habits and look for ways to make your chemical program more efficient without greatly modifying your current practices. Customize: We customize a safe, effective and efficient program for your establishment. Budget: We do a side-by-side comparison. Our goal is to save you 20%. We offer one flat monthly rate so you’re always on budget. Management: We manage the program and do all the work. We set pars, deliver the product and put away stock. Power Matters: We set up our products and system with enough power so your employees can effectively clean without bypassing the system. We make sure the employees are happy with the system. Fragrance Matters: Our products have extra fragrances providing a “smells clean” effect. Color Matters: In the same way that “smells clean” affect works, the rich colors gives the employee the impression that the product is loaded with the maximum amount of cleaning product. The real advantage to the management staff is that a manager can see from 40 feet away whether the employee is using the correct product for the job, that the product has been diluted correctly and that the product in the correctly labeled spray bottle. We Manage the Program: We provide quality products, monitor the usage and build the system with the employee in mind so the employees can easily work within the system. You budget for food, liquor and labor, so why are you not budgeting for a chemical program too? How much is the food house actually charging you for your chemical program? Why does the food house place chemical costs on the last page of your bill? Why are you depending on the food house for your chemical program? How many price increases have you had in the past 12 months? What if someone was monitoring your usage, so you could cut down on waste and misuse of chemicals by employees? Take the guessing and hassle out of your chemical program and switch to the Whole House Program with Cleaner Solutions. 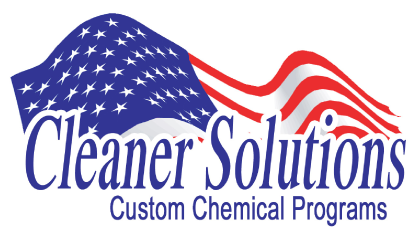 For more information and to get a free assessment of your current chemical program contact Cleaner Solutions today.